Xbox Live Gold members can look forward to two free games on Xbox 360 this July with "Gotham City Imposters" and "BattleBlock Theater!". On Xbox 360, starting Tuesday, July 1st, Gotham City Imposters (normally US $14.99) will be free for Xbox Live Gold members through July 15th. Then on July 16th, Xbox Live Gold Members can download BattleBlock Theater (normally US $14.99) for free through July 31st. *Titles are available as free downloads for qualifying Xbox Live Gold members in all markets where Xbox Live is available. Some regions may offer different titles depending on market availability. For more information on Gotham City Imposters or BattleBlock Theater, please check out all of our previous coverage via our Xbox 360 Games database on 360-HQ. 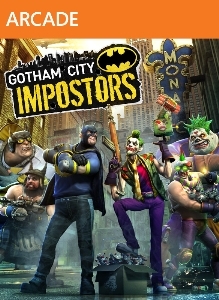 Gotham City Impostors out now on XBLA and PSN, launch..
Gotham City Imposters Hits January 10, 2012 - Open BETA.. Become a Nemesis 50 times. Earn 50 gold medals in Challenge mode. Win each game mode in Ace Chemical, Amusement Mile, Crime Alley, Gotham Power and The Docks. Turn the tables in Fumigation when the enemy team's victory is imminent. A demented horror game from Sega and Monolith, designed for next-generation consoles and game systems. You are an FBI agent on the hunt in this gripping and sickening hunt for serial killers. The game is played in first-person perspective, and with the use of the Havok 3.0 physics engine and other advanced techniques, players can utilize anything i..
You aren't a soldier. You are a weapon. A paramilitary force infiltrates a multi billion dollar aerospace compound taking hostages, but issuing no demands. The government responds by sending in its best special operations teams, only to have them obliterated. Live footage of the massacre is cut short by an unexpected wave of destruction that leaves.. The sequel to F.E.A.R. continues the supernatural suspense story of an escalating paranormal crisis that threatens to destroy a major American city. At the center of the calamity is the mysterious Alma, whose rage against those who wronged her triggered a chain of events that has spiraled completely out of control. Instead of playing as the Point M..
As Ethan Thomas, the unstable and disgraced Serial Crimes Unit investigator, players will face horrifying enemies and endless heart-stopping surprises in the shadows of a strange and sinister world. Players will utilize a new set of high-tech forensic tools and fight off violent enemies on the perilous hunt for Ethan’s missing partner. Ethan will n..